A temporary food service establishment is defined as a food service establishment that operates at a fixed location for a period of time not more that 14 consecutive days in conjunction with a single event or celebration. Local health department regulations may prohibit the sale of some or all potentially hazardous foods. 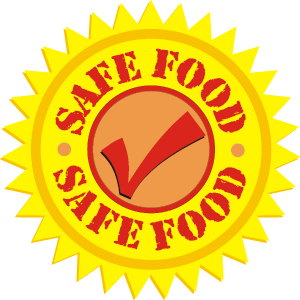 Commercially prepared potentially hazardous foods that are packaged in individual servings may be served. Don’t let foodborne illness from improperly handled food spoil your next event. The usual symptoms of foodborne illnesses are similar to the flu: nausea, vomiting, diarrhea and/or fever. To vulnerable populations such as children, pregnant women and the elderly, foodborne illness can be life-threatening. When preparing food for an event, remember that uninvited guests called bacteria are ready to strike! Follow the U.S. Department of Agriculture’s four steps to food safety and FIGHT BAC! 1. CLEAN - Wash hands and surfaces that come into contact with food. Follow cleaning with sanitizing to reduce the number of germs on a surface. Wipe or spray surfaces with a solution of 1 tablespoon of bleach per gallon of water; allow to air dry. 2. SEPARATE - Don’t cross-contaminate. Separate raw meat from other foods. Use clean cutting boards, containers and utensils. 3. COOK - Measure temperatures. 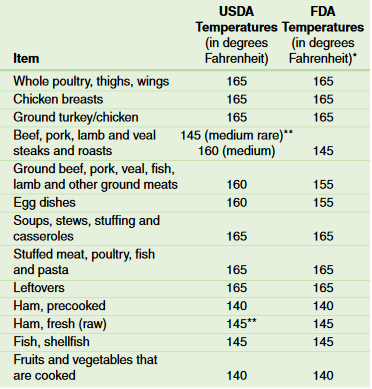 Use a clean, calibrated thermometer and place cold foods on ice at or below 40 F. Keep hot foods at or above 140 F.
4. CHILL - Refrigerate or freeze food quickly. Divide large amounts of leftovers into small, shallow containers for quick cooling. The operator is responsible for monitoring temperatures. *Recommended temperature must be maintained for at least 15 seconds on the thermometer dial. 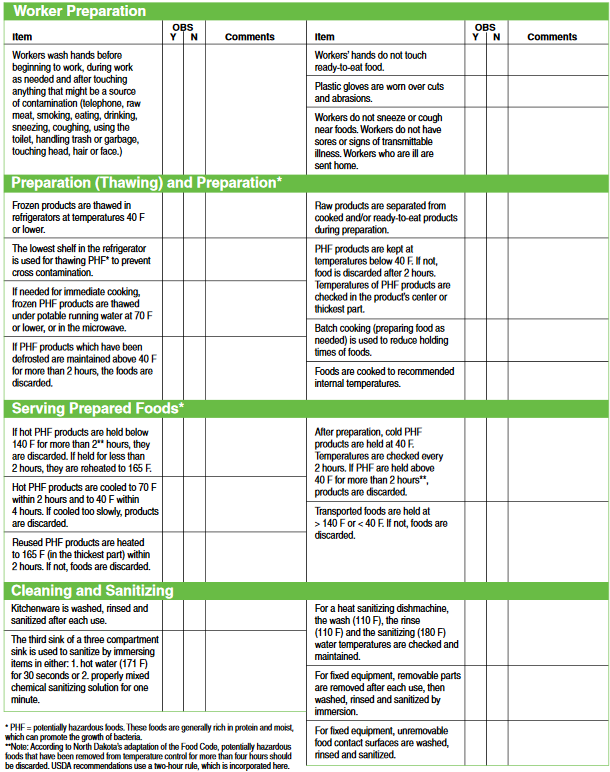 This checklist incorporates both USDA recommendations and Food Code guidelines. The more conservative of the guidelines are used. Always work with clean hands. Wash your hands for at least 20 seconds before you begin and after any task that may contaminate your hands. Hand-washing stations must be on site and accessible. Using gloves and wet wipes is not a substitute for hand-washing. Temporary stations (see diagram) should have a container with warm, potable, running water; a container/bucket placed under the tap or spigot to catch the wastewater; soap; paper towel; and a trash receptacle. ■ Wear hair restraints during preparation and service. ■ Serve food with scoops, tongs, plastic gloves, deli paper and ladles. Bare hands should not come in contact with food. ■ Use disposable paper cups and utensils and provide a trash container for customers. ■ Serve pre-portioned foods and cover appropriately with plastic wrap, foil or plastic bags. ■ Use single-serve condiment packets or dispense from squeeze bottles. ■ Hold potentially hazardous cold foods at 40 F or below. ■ Hold potentially hazardous cooked foods at 140 F or above during display and service. ■ Reheat previously prepared food to 165 F, using a stove, oven or microwave. ■ Use hot-holding equipment, such as chafing dishes, roasters, electric slow cookers and warming trays. ■ Check frequently to be sure food stays at or above 140 F.
■ Do not use an electric slow cooker to reheat food. These appliances are meant to hold “hot” food hot, not to reheat foods. ■ Discard any food left out at room temperature for more than two hours, according to USDA guidelines. Local health departments grant food stand permits and licenses on a per-event basis. Contact the local or state health department for information concerning rules and regulations or questions you have regarding food offered to the public.